Drink your milk, dear. Mommy's going to the back room for some bathtub gin. I don't remember eating at the dime stores but back in the '70s the local Sears, Marshall Field's and Walgreens all had some form of restaurant. A patty melt from the Woolworth lunch counter in Dublin,GA. If I close my eyes I'm there. This is turning into a real nostalgia trip for me, Woolworths growing up in Union City in the 50's and then down here in Brick in the early '60s with H.L. Green, another dime store. So many lunches there. Such a simpler time. Good food fast (not fast food). I repeat GOOD FOOD, FAST...NOT FAST FOOD!!! 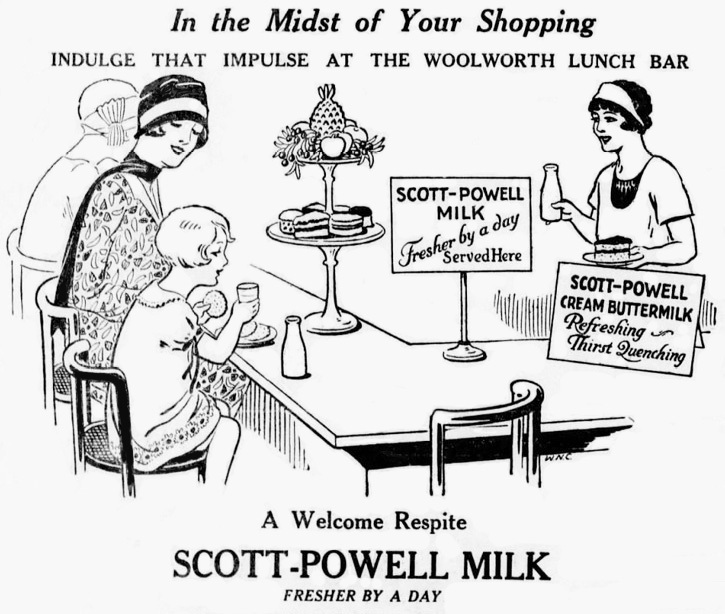 I routinely ate at Woolworth's in Birmingham when I was a teenager. They had multiple locations and you could get a good hamburger combo for about $3. Fried chicken platters were under $5. The drugstores had such great lunch counters too! I remember them well...along with Woolworth's! Jane and Michael' book Square Meals has a great chapter on lunch counter type foods and recipes. Drug and dime store lunch counters and soda fountains are one of my favorite roadfood genres. I always look for them when planning a trip. I remember our local shopping mall having a dime store with a lunch counter when I was a kid. At at the Woolworth's with a friend and her mom back in the 1960s. Think it was the one in Wonderland Mall in San Antonio. Joske's Department Store at the Las Palmas Shopping Mall in San Antonio had a lunch counter. Momma would get her hair done, and we would have lunch there. My favorite thing to order was the cheese enchiladas. This was in the 50s. Recall the last time i was in Milwaukee and we went to some mall, we ate at the Boston Store in their cafeteria. Had either a hot roast beef, or hot turkey sandwich. This was served open faced style with gravy,etc. There is a book called Counter Culture in regards to Texas. There was a dime store in Seguin, our county seat that had a lunch counter. Got to go out there some time to the library and see if the place is still there. After school, I'd often stop at W. T. Grants for a crispy, roller-grilled hot dog on a toasted New England bun. Woolworth's lunch counter had roller-grilled dogs in toasted and buttered New England buns, too. You couldn't buy that style of bun in grocery stores in Indianapolis in those days. I loved them. Still do. Only kind of acceptable bun for Connecticut-style hot lobster rolls, in my opinion. It was a ritual for me to go to Woolworth's (located in an early "shopping center" in north-suburban Indianapolis) with my mother on the first day of school (which was always a half day for elementary school) with my school supply list. We'd buy the supplies, and then have lunch at the counter. My brother and I were only allowed one Coke (or other carbonated beverage) each week -- usually on Saturday night, with homemade popcorn -- so it was a real treat to have that lunch, because Mom would let me have a fountain Coke with my hot dog. When I was a kid growing up in Newport News, VA. in the 60's, shopping trips with Mom often included lunch at Woolworth's in downtown NN. Hot Dogs, Hamburgers, Grilled Cheese Sandwiches.....great memories! At the Kresge's department store in downtown Birmingham, Michigan; when we were kids my friend and I would go to the lunch counter to eat. We'd order one sandwich with some extra butter .... and two coffee cups of hot water. Also just ice waters to drink. From the bottles on the counter, we'd put ketchup in the hot water and add some butter to make tomato soup, and then split the sandwich. The women who ran the lunch counter didn't care for our antics though ... formidable, upper-middle-aged women with tight, beauty-parlor hairdos and who looked like a pancake makeup factory had exploded near them. They would be quite unpleasant to us ... so when they weren't looking we'd leave an "inverted tip". Then place any stiff piece of card or paper on top of the glass to seal it (a menu works good), hold the menu to the mouth of the glass, and deftly turn the glass with menu upside down and set the whole thing on the counter ... and then pull the menu out from under the glass. The only way to get the tip out is to lift the glass (the water would flood the counter) and it is nearly impossible to slide something back under the glass to turn it upright again. We'd have to keep out of Dodge for a while while things cooled down at the ol' Kresge corral ... hiding out at the railroad tracks and avoiding the Grand Trunk police. Ahhh, youth.